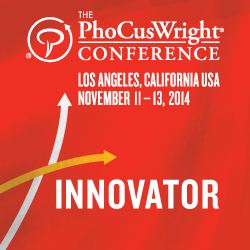 mTrip is honored to be selected as an Innovator for at The PhoCusWright Conference on Tuesday, November 11, 2014 in Los Angeles, California! As an innovator mTrip will be presenting its mobile solution for Tour Operators and Travel Agencies at the The Travel Innovation Summit and have a booth at the Innovator Showcase. The PhoCusWright conference is the leading travel and technology industry conference focused on demonstrating and featuring market-changing innovations with the potential to transform travel planning, purchasing and memorializing. mTrip was selected for it’s new White Label Solution for Tour Operators and Travel Agencies. Focusing on the needs of tour operators and travel agencies, mTrip’s mobile solution is tailored for both independent travelers (FIT) and Organized tours and aims to increase client satisfaction, boost brand visibility and reduce operation costs.